OFFI has created an heirloom quality table accommodating the wants and needs of both the young and young at heart. For the very young it's a low, soft, and inviting form that provides an aid to help in the process of standing up and negotiating furniture for the first time. The low casual stature of the table gives older kids an inviting space to gather around. For adults this rational form is an elegant and sensuous table that provides an effortless solution for smaller living spaces. In addition, the useful storage pouch creates a convenient place to keep those magazines and books close at hand. The design of the Scando Table was inspired by both Japanese living and long hours of observing how children relate to the floor in their daily activities. They've created a table that engages children and accommodates their diverse activities, while addressing the needs of adults who want furniture that is elegant, expertly crafted, and multi-functional. A table the whole family can love ... we do! 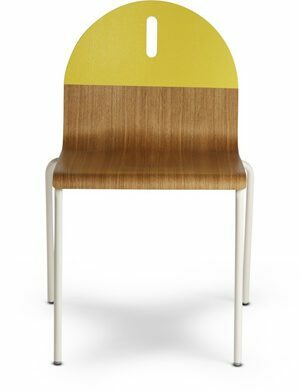 Molded plywood in birch, oak, walnut veneer, or white lacquer.